NAR's February existing home sales plunged 7.1% from January's six month record high. Sales were 5.08 million, a far cry from January's 5.47 million annualized sales. 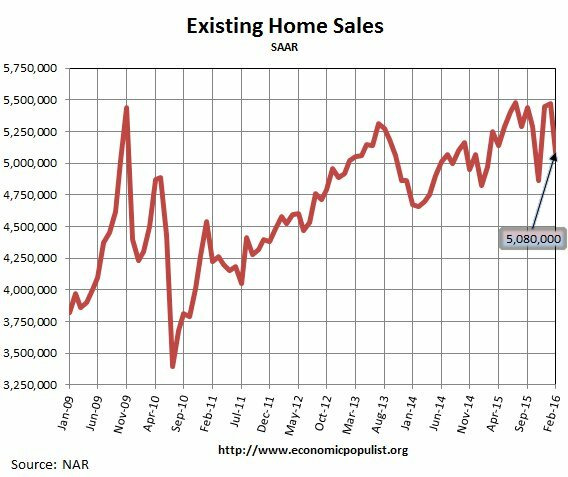 In February 2007 existing home sales were 5.79 million. Sales are now 2.2% higher than a year ago. Prices are through the roof and inventories are very tight. Affordability and availability are cited as the main reasons for the drop in sales but NAR also hints at economic unease among potential buyers. The national median existing home sales price, all types, is $210,800, a 4.4% increase from a year ago. This still beats the $230,400 July 2006 high, but not by much and we know what happened in 2006. The annual median price has also increased for 48 months in a row. The average existing sales price for homes in February was $253,900, a 2.5% increase from a year ago. 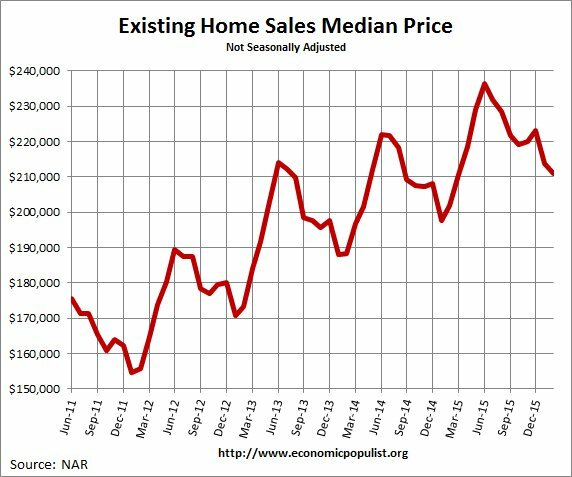 Below is a graph of the median price. The overall demand for buying is still solid entering the busy spring season, but home prices and rents outpacing wages and anxiety about the health of the economy are holding back a segment of would-be buyers. Distressed home sales were 10% of all sales. Distressed sales were 11% of all sales a year ago. Foreclosures were 7% while short sales were 3% of all sales. The discount breakdown was 17% for foreclosures and short sales were a 16% price break. Investor sales have trended surprisingly higher in recent months after falling to as low as 12 percent of sales in August 2015. Now that there are fewer distressed homes available, it appears there's been a shift towards investors purchasing lower-priced homes and turning them into rentals. Already facing affordability issues, this competition at the entry-level market only adds to the roadblocks slowing first-time buyers. The median time for a home to be on the market was 59 days. Short sales by themselves took 126 days, foreclosures in 57 days and non-distressed homes also took 57 days. Housing inventory from a year ago has decreased -4.7% but is down -0.4% from the previous month. Current the 1.88 million homes available for sale are a 4.4 months supply a 10% time increase from last month's 4.0 month supply. That is -4.3% lower month's supply than a year ago, showing just how tight the existing home sales market is now. NAR noticed that a blizzard impacted contract signings as well as the usual suspects: prices are too high, inventories are too tight and overall the economy looks weak. The lull in contract signings in January from the large East Coast blizzard, along with the slump in the stock market, may have played a role in February's lack of closings. However, the main issue continues to be a supply and affordability problem. Finding the right property at an affordable price is burdening many potential buyers. Below is NAR's breakdown by existing home sales type and regions. The west has the most unaffordable housing consistently, but the northeast isn't far behind. Who can pay the average $346,300 average price in the west? February existing-home sales in the Northeast descended 17.1 percent to an annual rate of 630,000, but are still 5.0 percent above a year ago. The median price in the Northeast was $239,700, which is 0.8 percent below February 2015. In the Midwest, existing-home sales sank 13.8 percent to an annual rate of 1.12 million in February – unchanged from February 2015. The median price in the Midwest was $162,700, up 6.3 percent from a year ago. Existing-home sales in the South decreased 1.8 percent to an annual rate of 2.20 million in February, but are still 3.3 percent above February 2015. The median price in the South was $186,400, up 5.0 percent from a year ago. Existing-home sales in the West declined 3.4 percent to an annual rate of 1.13 million in February, but are still 0.9 percent higher than a year ago. The median price in the West was $308,800, which is 7.0 percent above February 2015.